But I love Halloween. My whole family loves Halloween. I’m not sure I’ve ever gotten a Christmas card from my family, but I ALWAYS get Halloween cards. This year’s from my sister made such creepy sounds that I’ve scared my husband with it twice. I miss my family during the holidays, and Halloween is when it always starts. I miss being gathered around my parents’ bathroom mirror with face crayons and latex wounds. Zombies are and will always be the best costume. A little dead. A little silly. A lot of ugly face contests with my sister. 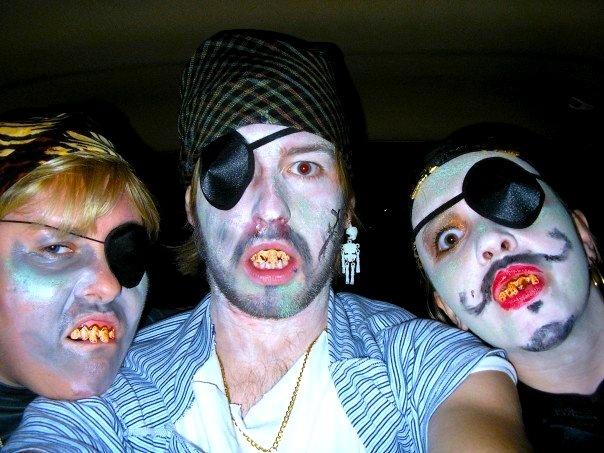 As we began to get older, we started dressing up just to go out to places in costume. We would crash parties in costume, walk around Walmart, or go out to a restaurant, all just to laugh with other people who were laughing at us. Here’s my mom, my sister, and me, heading to my younger sister’s friend’s Halloween party. We were not invited. We also dressed up for Halloween Dinner. We did this for the first time when my aunt and cousin were living with us. I borrowed my aunt’s silk pants and a sparkly turban from my mother and ate dinner as The Genie. THE HOCUS POCUS HALLOWEEN DINNER! Itch-it-a-cop-it-a-Mel-a-ka-mys-ti-canadian Bacon and Cream Cheese OOOOON TOAST!